I have noticed this book a while back, when it was released, but never really picked it up. A well-known online bookstore sent me a notice about this book's existence. At that time, I figured that this would be a cute read, but I didn't pay much attention after that. Not until when I decided to go to the university's Undergraduate Library, and spend some time reading there. 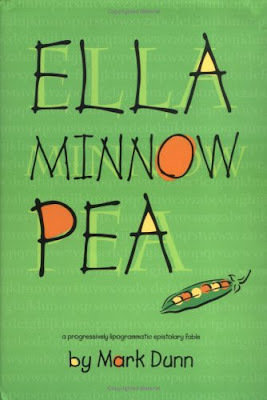 I gave in to temptation and browsed the shelves where they have fiction, and sure enough, Ella Minnow Pea by Mark Dunn was there. I decided to check it out. After spending just an afternoon reading this book, I finished all 200-something pages of it. It is subtitled as a "progressively lipogrammatic epistolary fable" which I thought was very apt. So, this book is about the fictional country of Nollop, off the coast of South Carolina, where the supposed creator of the well-known pangram "The quick brown fox jumps over the lazy dog" is revered to a God status. There is a high council composed of five elders, which then issue laws and statutes that should be obeyed all over the island. There is also a monument to Nevin Nollop, where the pangram sentence is written, using tiles that bear the letters. Now one day, one of the tiles fall off, and the council thinks that this is the voice of Nollop from the grave. They then decide to ban the use of that letter. Obviously, you may know where the story is heading, given this premise. People are made to resort to different strategies in order to avoid the banned letters, and when they make a mistake, they get banished off the island. A number of points are worth mentioning here. I like the novel due to the fact that even though the story is presented with a comedic air, the issues that the novel deals with aren't comedic at all. The novel deals with totalitarianism, where the only voice that matters comes from a council composed of five men. No one is allowed to argue with the council, who thinks that they serve Nollop and Nollop alone. They are in essence, infallible. There was an episode in which an American researcher visits the island, and provides chemical samples that the reason the tiles are falling off is that the glue that was used years ago are just wearing off, instead of attributing it to the will of the dead Nollop. However, the council interprets that as Nollop operating through science. Again, an untestable statement. In essence, as funny as this novel may be, this is a novel portraying the battle between dogmatism and rationalism. This is another appeal that humans ought to use their heads and think, that humans ought to test ideas and subject them to scrutiny, not just merely letting other beings do the thinking for them.